Originally uploaded by Dr Momentum. were on their way to class. At goose school. In the river. Where you learn to do goose stuff. But were they goose-stepping? Are you down with that? Most excellent that you had your camera with you! I always carry my older camera with me in my satchel because I use it at work to take pictures of whiteboards from meetings. My satchel was beside me, and I was at the light for a couple of cycles, so I had plenty of time to get my camera out. Of course, once there was room to go around I only had about two seconds to snap a shot because people were eager to get on their way by that time. At least they were going with the light! 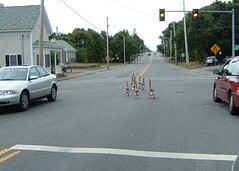 If that was in Fall River, we would have run those goddamn geese over! I ain't got no time to be waiting on no geese.